Some time ago, someone making a history program for BBC Knowledge approached me with some questions regarding longbowmen. The Questions and Answers follow. Q: Why are they [longbowmen] so unknown? Or not many people know who they were? A: My theory for why longbowmen are relatively unknown in the anals of medieval warfare is that being an archer was not a glamourous job. Though renowned and revered for their skill, longbowmen were certainly not of the nobility. 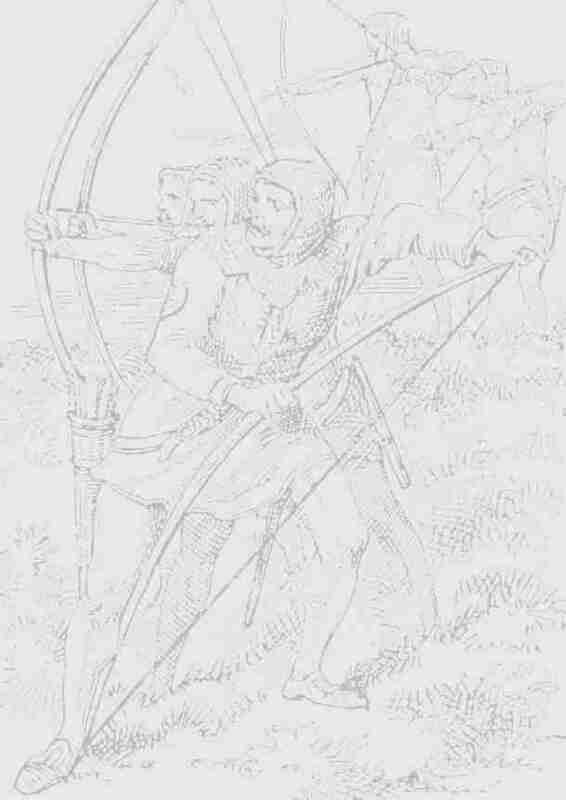 Longbowmen were recruited from the commoners. In short, they do not fit the romantic image of the knight in shining armour. In addition, a single longbowman is a rather ineffective military unit. It is only when many longbowmen are used in conjunction that they become an extremely formidable force. In this way too, they do not fit a romanticized image of a single warrior producing great feats of strength and bravery against an overwhelming evil. Another possibility is that many (if not most) of the longbowmen fighting for England were in fact, Welsh. The Welsh, from what I understand, were considered second rate citizens at best. The Welsh, however, gave more than one conquering nation a great deal of trouble by wielding their bows and arrows. Q: How did they manage to be so skilled? A: As for how the longbowmen became so skilled, well I can sum that up in three words: practice, practice, practice. Even when not in war, longbowmen, who no doubt took great pride in their craft, would practice regularly. Many towns and villages had what I believe are called marks. Marks were basically areas of country side wherein someone put up targets for archers to practice on. The marks courses would give archers practice in different terrain and at different ranges, in order to hone their skill. At certain points in history, the training of longbowmen was well supported by the crown as well as the populous. It was common practice in Medieval England for the people to practice archery every Sunday to keep their skills up. Nearly all Medieval towns in England had what are called butts, which is a place where people could practice their archery skills. It is telling to note that even today, according to one person who wrote me, many towns still have Butts Roads or Butts Lanes, presumably related to where villagers practiced their archery every Sunday. Q: Who would have trained them? A: As for who trained them, I can only assume that they would have been trained by experienced archers. There are a few key skills one must learn in order to become a good archer. Beyond that, the difference between a mediocre archer and an excellent archer is merely experience and practice. A testament to the simplicity of archery is that archery has changed very little from its beginnings all the way to the present. The materials and designs of the equipment has changed rather dramatically, but the actual art of loosing an arrow at a target is very much the same as it would have been in the Medieval Period and even long before then. Q: Are modern day archers any where near as good? A: Modern day archers are as good as Medieval archers, but I suspect that they are much less common now. I am excluding in this argument, the beneficial effects of new materials and designs for the hardware portion of the equation. There have been a number of recent archers who have been able to attain astounding distances with traditional longbows. Don't quote me on this, but I believe that it was either William F. Paterson or Roger Ascham who was able to attain 490 yards with a traditional longbow. Or perhaps it was Robert Hardy. I know a gentleman in Netherlands who practices in the marks and is quite good. His son is even better, often hitting small targets at over 300 yards, all using traditional longbows. Many modern day archers can achieve an accuracy and consistency unheard of in Medieval times, but that is often largely due to better designs and materials. Q: Do you know of any good places to go and get archive material/documentary evidence about clothes they [longbowmen] wore? A: The clothes they wore were quite simple. To my knowledge, English longbowmen wore a uniform of a white tunic with a red cross on the front and back. They wore little or no armour. They wore no armour not out of lack of wanting it, but because they couldn't afford it. If they did wear armour, it was usually leather armour. Q: Were they [longbowmen] crucial in hundred years war? A: Although I cannot say just how important longbowmen were to the 100 years war, I would venture to say that they were very important. Although I undestand that the Battle of Crecy is only marginally considered a part of the hundred years war, the battle was a decisive battle in which English longbowmen annihilated a large French army almost single-handedly. If memory serves, of the thousands of French who died on that battlefield, a mere handful were killed at the hands of the general soldiery or the knights. Nearly every man killed that day was killed by the longbowmen. Although Crecy was arguably the most one-sided victory for longbowmen, similar feats were fairly common. Q: Any documentary evidence about them being released from jail to fight in the wars? A: I seem to remember reading somewhere that archers were released from jail to fight in the wars, but I cannot recall where I read it. Perhaps it was in Hardy's book.